St. Paul third-year coach Keith Wiatrak likes to share a story from his playing days with the Indians. Longtime coach Doug Tuck arrived when Wiatrak was a sophomore. St. Paul went 1-8 the first two years. The next season, 1991, St. Paul delivered one of the biggest one-season turnarounds in Kansas high school football history. The Indians went 12-1 and lost to Claflin in the Eight-Man, Division II state championship game. “Any given year you can turn it around,” Wiatrak said. Wiatrak served as Tuck’s assistant for 14 years, including helping on the ’00 and ’02 state championship squads. Tuck (180-70 in 25 years) still remains at the school, but Wiatrak took over the program three years ago. In 2013, St. Paul finished 1-7 and had to call timeout in a game against Crest, because the Indians had just seven healthy players. The pause allowed a St. Paul player to regain health and come back into the contest. However, the 2013 team had plenty of talented freshmen who started. Since then, Wiatrak has authored another turnaround, especially this season on the defensive side. St. Paul, led by senior running back/defensive back Chandler Struthers, could deliver another historic run deep into November. St. Paul is 7-0, 3-0 in Eight-Man, Division I, District 1. That includes a key 66-42 district road win versus then-undefeated West Elk in Week 6. The contest ended the Patriots’ 16-game regular season winning streak. 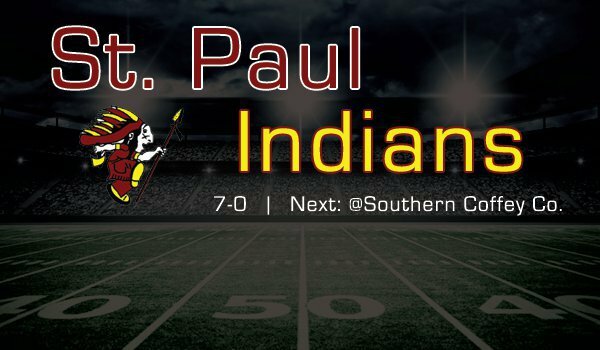 St. Paul closes with a road game at Southern Coffey County (1-6, 0-3) and home with Sedan (6-1, 2-1) and can clinch a playoff spot with a win by at least 21 points this week. The Indians are one of eight perfect eight-man teams, including six in their classification, and the only one unranked. St. Paul is tied with Burlingame in scoring offense at 56.3 points per contest and rank fourth in scoring defense at 11.4 points permitted a contest. Last season, St. Paul allowed 39.3 points per game. The Indians, known for their speed, have no player weighing more than 220 pounds. All the starters, except one on defense, are juniors and seniors. After the one-win season in 2013, St. Paul has posted 3-6 and 6-3 records the last two years. The Indians have not reached the playoffs since 2010. This season marks the Indians’ best scoring offense defense in the last 11 years, according to Prep Power Index archives. Other than Osborne in 2013, no eight-man team has won a state title after not making the playoffs the previous season since Midway-Denton in 2000. “These seniors have been starting since they were sophomores and freshmen, and they have just been in the weight room and working hard, and they just grown up, and they are bigger and stronger than they were last year,” Wiatrak said. In Wiatrak’s first season, St. Paul had just three seniors and one junior. The team had just three players who could bench more than 200 pounds and often had trouble at the point of attack. Wiatrak’s goal was four wins. Last year, the Indians were in the low 20s for numbers, and Wiatrak was “really happy” with the season. St. Paul had four seniors and five juniors. This fall, St. Paul returned six starters on both sides. All the offensive starters can bench more than 200 pounds and squat more than 300. Struthers rushed for 900 yards as the fullback last season and then moved over to tailback this fall. He weighs between 165-170 pounds but can squat 360, has a strong lower body and is a hard runner. Struthers leads the team with 1,360 rushing yards and 30 total scores. He has returned the opening kickoff twice for scores and another one against West Elk. “Open space, he is fun to watch,” Wiatrak said. Senior Noah Winter first started off-and-on at quarterback as a sophomore and is the full-time starter the last two seasons. Junior right guard/nose guard Anthony Albertini has started since his freshman year. Junior left guard Koby Spielbusch started part of his freshman season and all last fall. Senior left end Jace McCracken is a four-year starter. Senior right end Patrick O’Brien is a multi-year starter. Junior Grant Hutcherson has taken over at center. Defensively, Wiatrak has kept the 3-2 defense that Tuck ran. Wiatrak called the defensive backs the team’s biggest strength and the main reason for the big improvement. He moved Struthers from linebacker to defensive back this season. Winters starts at defensive back, along with junior Braven Born, who Wiatrak said has “come along wonderfully.” Collin Carlson is the lone sophomore starter. The team heavily focuses on the basics, including an hour of fundamentals each Tuesday. He rarely doesn’t have a nose guard and doesn’t rush the defensive ends up field. The team focuses on stopping the run first. Albertini was an all-league nose guard last season and has played well again. The West Elk victory, a surprise to some, vaulted St. Paul to the top of the district and ended a three-game losing streak against the Patriots. West Elk has a massive, experienced offensive line with three starters at least 250 pounds. St. Paul permitted 474 yards, but just 6.5 yards per play, and most impressively, 4.2 yards per rush for 219 rushing yards. It marked West Elk’s lowest yards per carry average since Week 7 of the 2014 season. In a first round playoff loss to Hanover last season, West Elk averaged 5.9 yards per rush and 353 rushing yards.